There is something about setting a series of tasks for yourself, especially if there is a time limit to complete them. It sets in your mind. After an initial burst of energy it becomes zen, a focus that blocks out other things. In this case I gave myself 33 tasks and 72 hours. Some were longer than others. 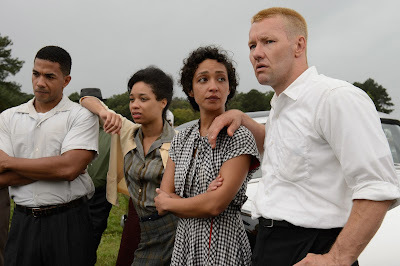 Some were more interesting. I set out to photographs every lock on the Erie Canal. This year is the bicentennial of the beginning of construction on the original Erie Canal. 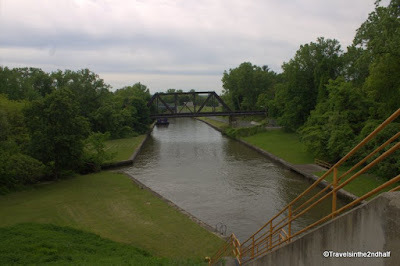 Finished in 1825, the Erie Canal opened the west to the direct transport of goods. Prior to that everything had to be taken by cart over land. The canal spurred the settlement of western New York and Pennsylvania by taking a trip of up to 45 days and shortening it to about 9. It provided a faster and cheaper way for farmers to send grain to the cities along the coast and for industries in those cities to send manufactured goods to new settlers. It also allowed industry to develop along the rivers throughout the state by providing a distribution system both east to Albany and New York, and west to the Great Lakes. The original canal traveled 360 miles on its route from Albany to Buffalo, as it rose a total of 600 through a series of over 50 locks. It was 40 feet wide and 4 feet deep. Over the next hundred years many improvements were made to the canal, until, in 1908 a massive reconstruction was undertaken. 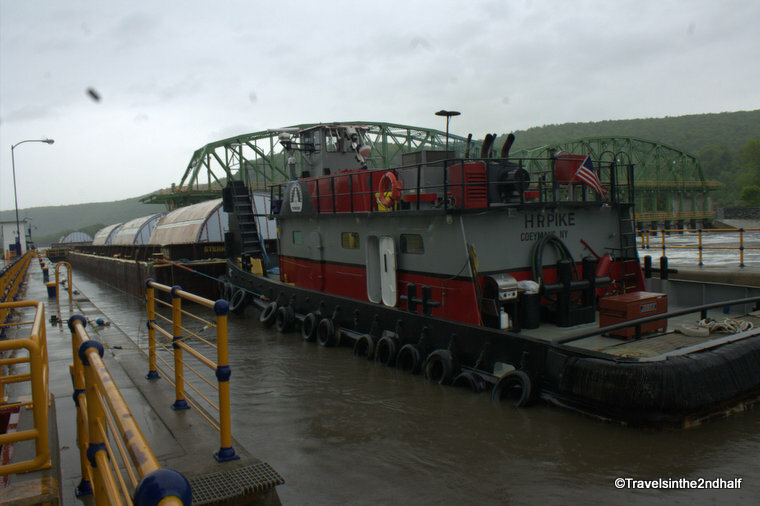 New tugs and barges were self-propelled and needed a wider and deeper passage. 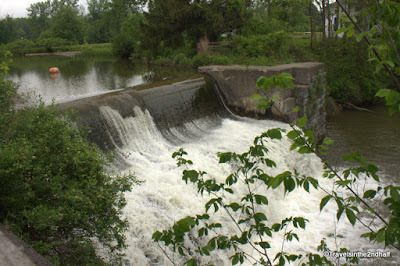 Much of the canal was moved to take advantage of rivers and lakes that the original had avoided. 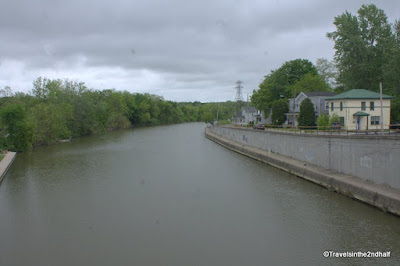 Passing through the Mohawk River, Oneida Lake, and then several rivers of western New York before ending at the Niagara River at Tonawanda. 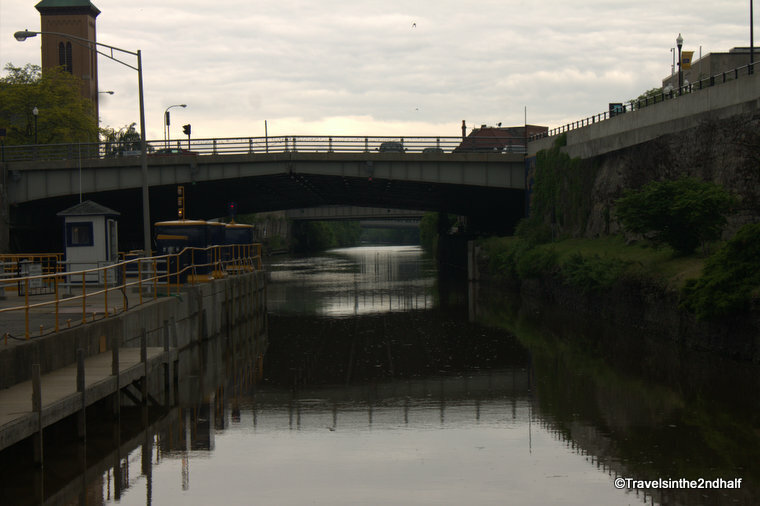 My series of tasks took me the length of the canal, Albany to Buffalo. I stopped at 33 locks, missing only Lock E-11 because it was under construction. 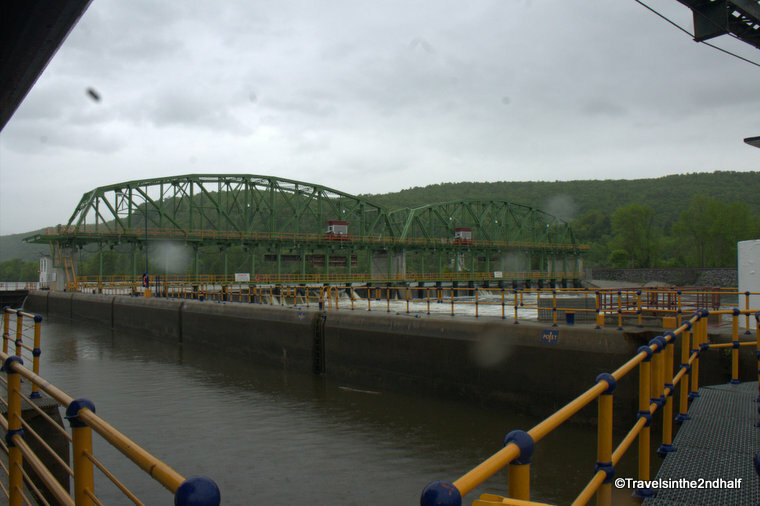 The locks are all freely accessible. Some have great parks set up along them. Some are in the center of town. Some are down a long road, with questionable maintenance. Each lock has its own personality. 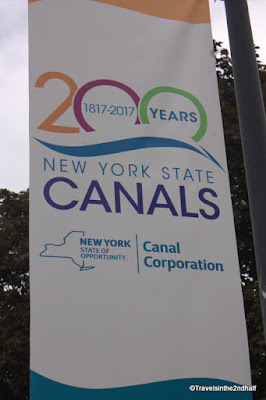 I learned a lot about the history of the canal. 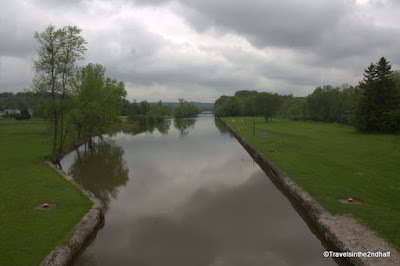 I learned about the role that the canal plays today, both for recreation and industry. 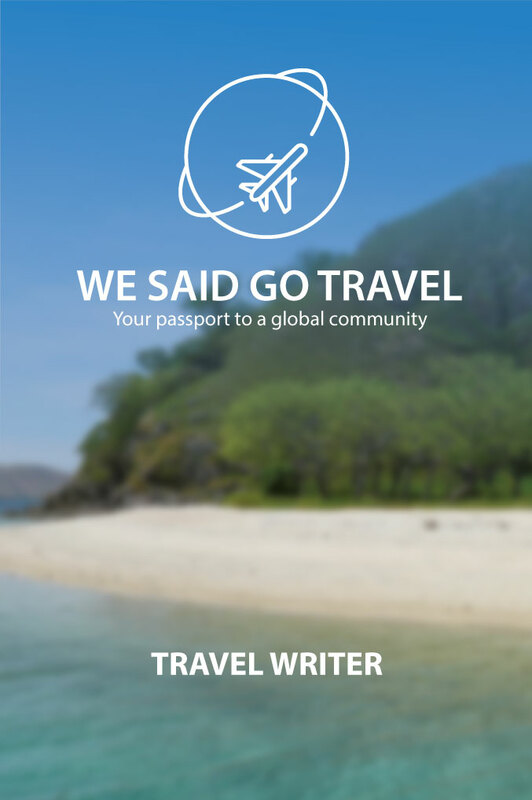 I have created a page with all of the pictures that I took on this trip and here are some of my favorite stops. The eastern section of the Erie Canal follows the path of the Mohawk River. This gives a wide and fairly deep passage for the barges and tugs. 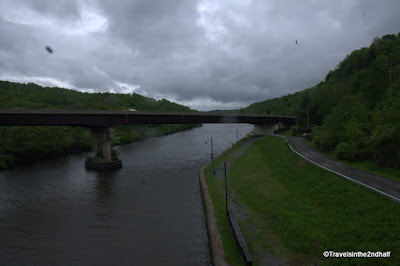 The problem is that in the last five miles, the river drops over 150 feet as it comes off of the Appalachian Plateau. 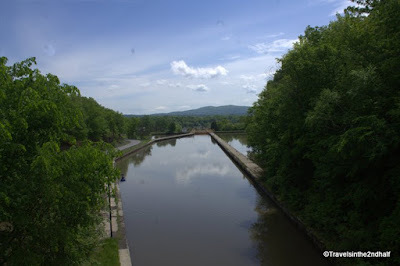 So the first five locks of the canal raise the water level from 15 feet to 184 feet in the space of one and a half miles. 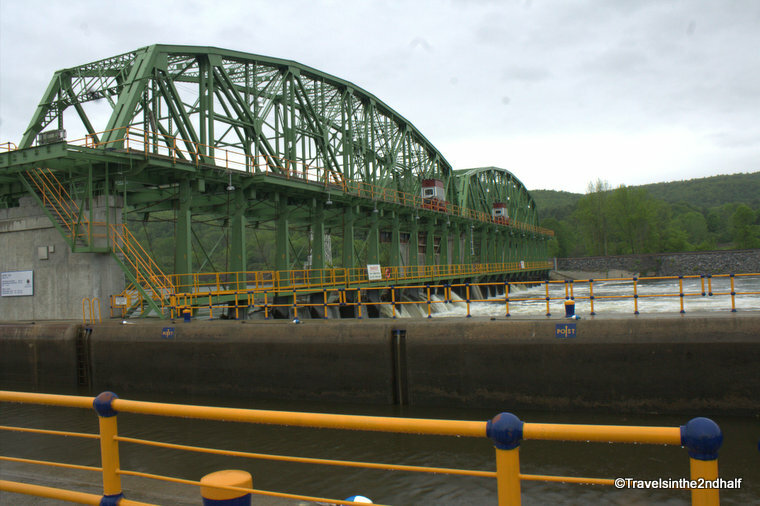 The locks were built to by-pass Cohoes Falls. 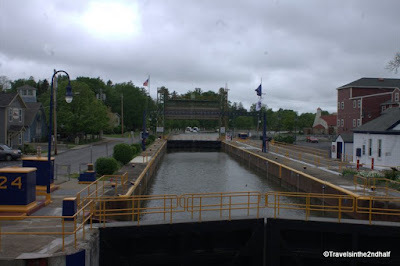 Each of these locks has a rise of over 30 feet, some of the largest on the canal, and they are so close together that this was the only section where I could stand at one lock and see the next lock both up and down stream. 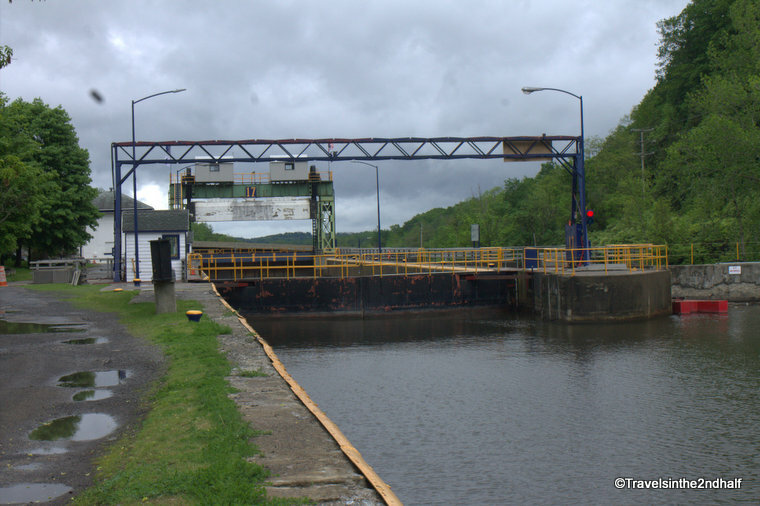 I said before that all of the locks are freely accessible, and that is true with one exception. Lock E13 sits between the towns of Fonda and Canajoharie. 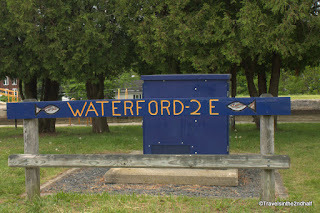 It is unique in that you can only reach it from the west-bound New York State Thruway between exit 28 and 29. The lock has been developed with a rest stop featuring a “Taste of New York” store and a canal heritage center. It was here that I first encountered an example of how the Erie Canal still serves a commercial function. The Genesee Brewery was shipping twelve new vats to Rochester NY. 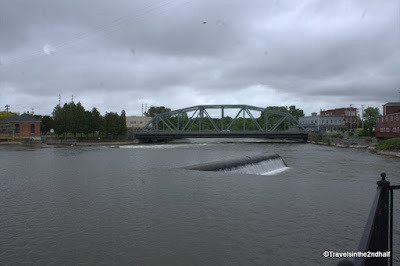 The 20 foot x 60 foot tanks are too large to transport by road or rail, so they were being barged up the canal. They traveled on four barges, with two tugs pushing two barges each. The problem was at the locks. 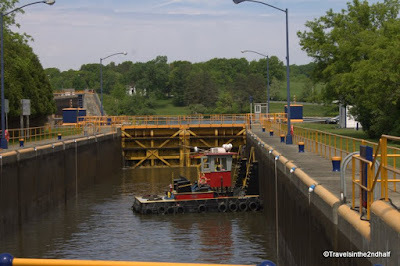 The locks are big enough to hold one barge and its tug. 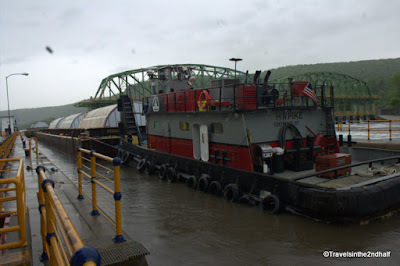 So when the tug arrived at a lock the tug pushed into the lock. 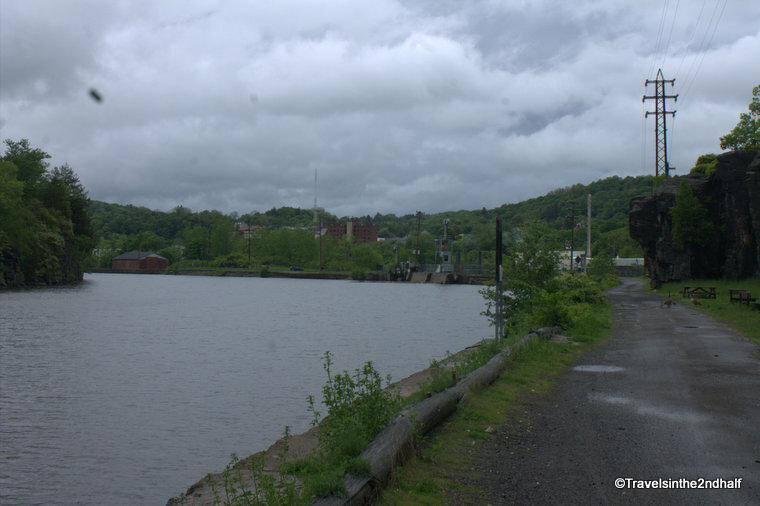 The first barge was unhitched and the tug then backed out with the second barge. The first barge was then cycled through the lock. 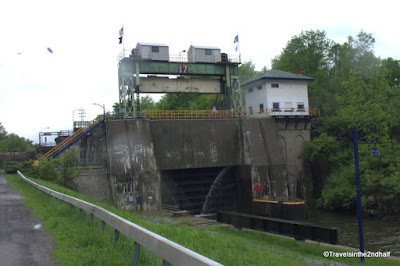 When it reached its new level, the barge was pulled out of the lock by a winch. 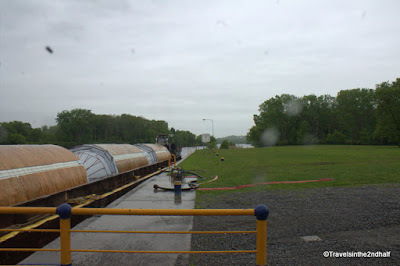 The lock was then recycled and the tug and second barge were cycled through. The first barge was hitched to the tug again and they were off. 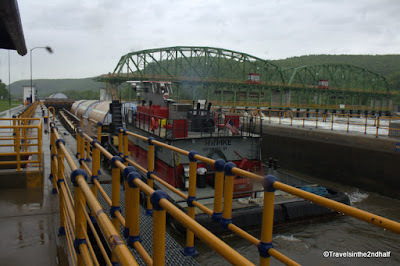 This process was repeated at 31 locks for each tug. It was quite a sight. 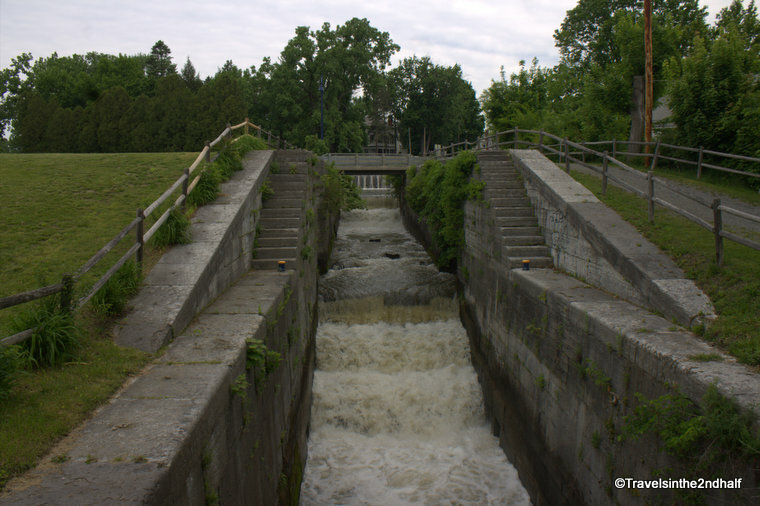 At 40.5 feet, the Little Falls lock is the highest rise on the canal, and its setting is as dramatic as it is high. While the Mohawk River traverses a series of cascades on one side of Moss Island, Lock 17 has been carved out in a valley on the other side of the island. It is a beautiful and striking vista. 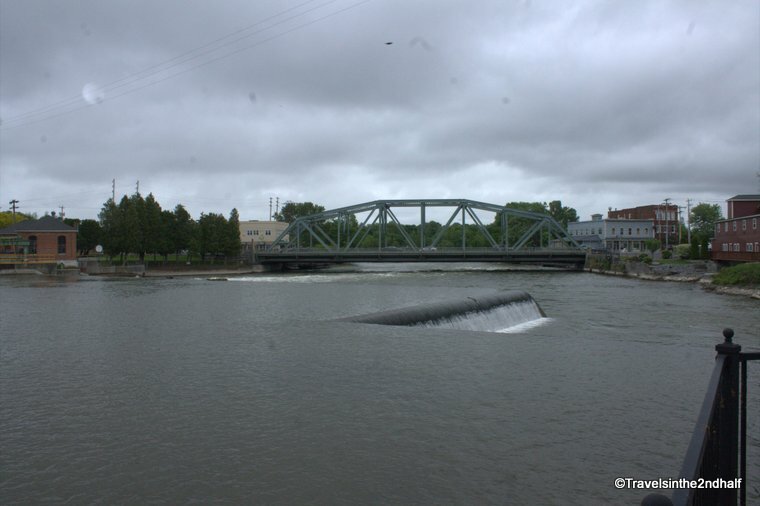 This lock sits in the center of Baldwinsville NY. It is such a part of the town that as I was taking photos I watched several groups of people use the lock as a shortcut across the Seneca River. This was my third time visiting this lock. 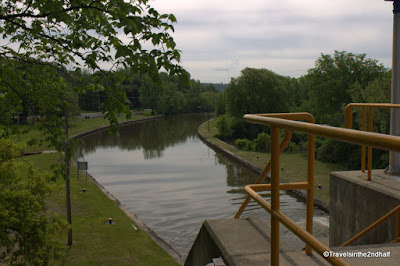 What I really liked about this lock is park that has been built alongside it. 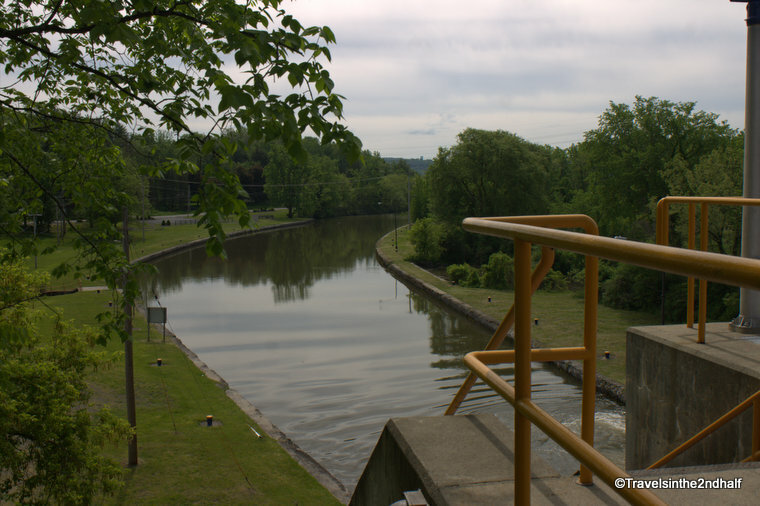 The canal is accompanied by a biking/hiking trail for its entire length. 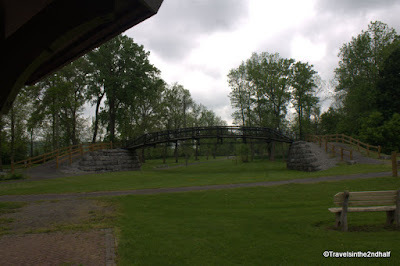 In some places it is a well groomed path, in others a paved trail. In Palmyra there is a developed park with picnic facilities and a hiking trail. There are the remains of part of the aquaduct from the original canal here also. 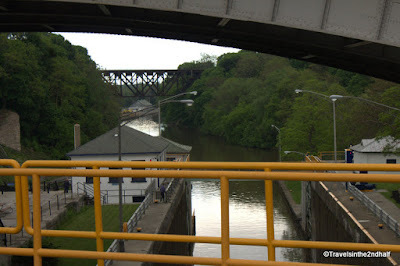 The last two locks of the canal are in Lockport NY. They are the last steps up to the Niagara Escarpment. 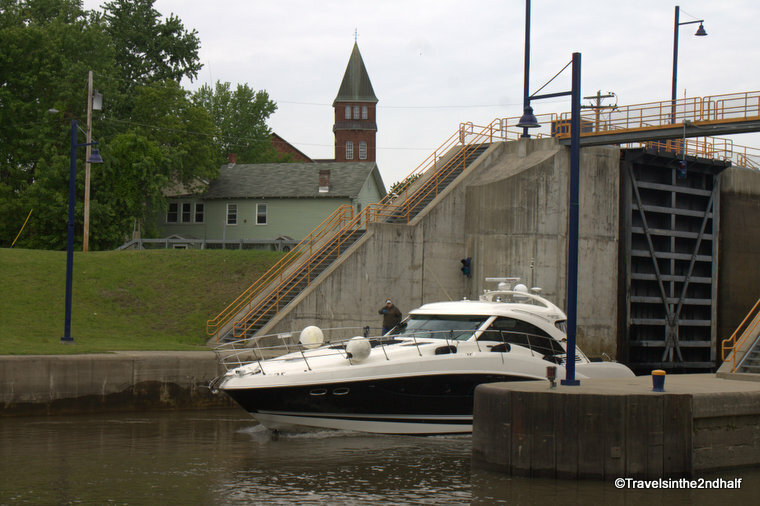 This last rise of almost 50 feet is now accomplished through two locks that are in series. 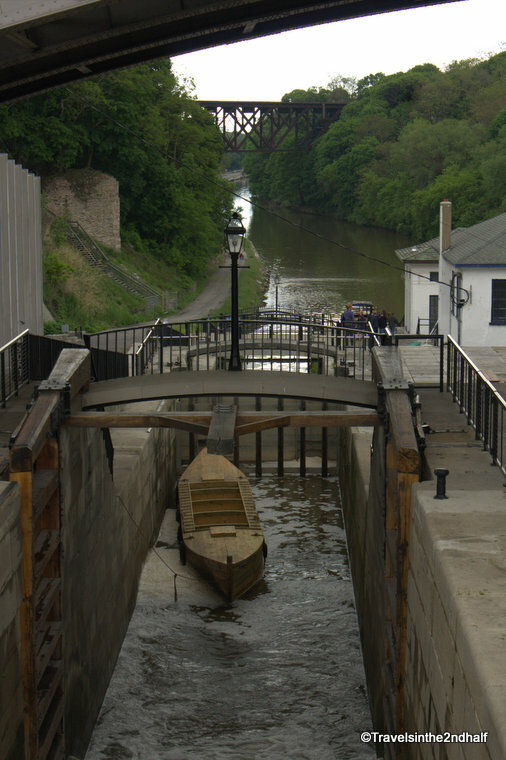 They replaced a series of five locks from the original canal. 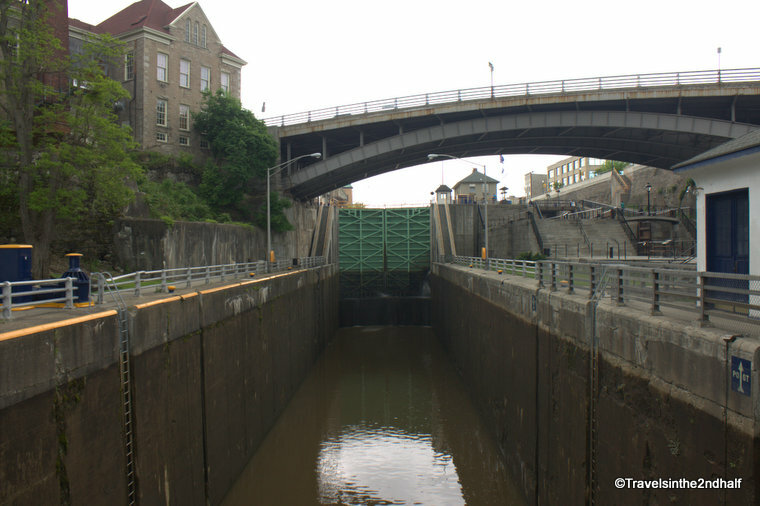 In fact, the Lockport rise was so important that they built 2 sets of locks, next to each other. 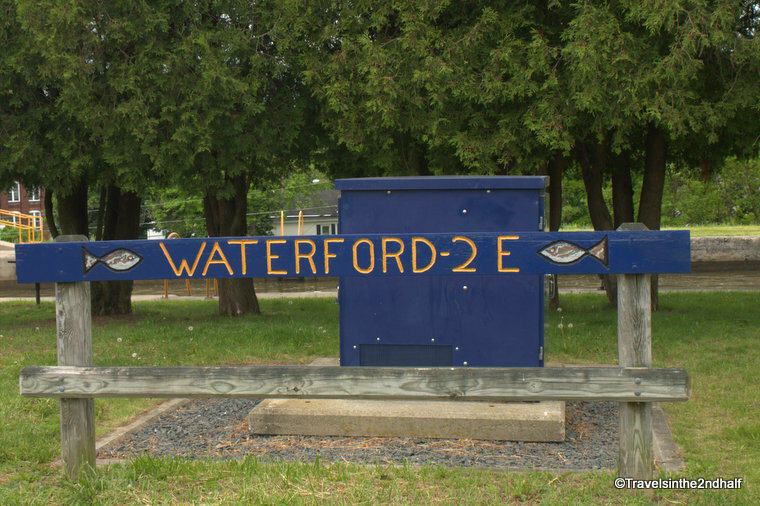 One set for the west bound traffic and one for the east bound. Today, there is a Canal HistoryCenter near the locks and there is tour that you can take that goes behind them. 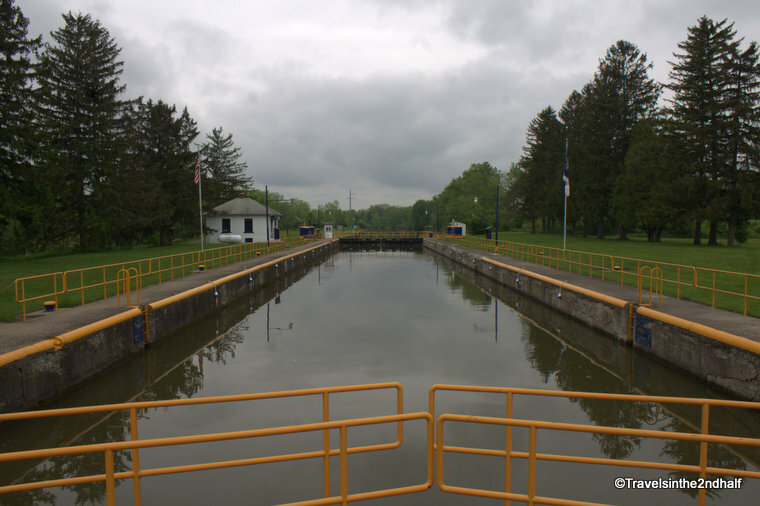 The locks on the Erie Canal are open to anyone who wants to stop by. 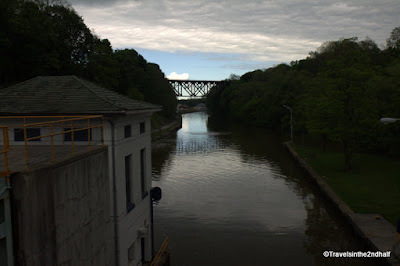 If you are traveling through New York, take some time and visit them. Thank you, very interesting; I was not aware of these locks and the history.